Preheat oven to 425. Melt 1 tbsp ghee in a cast iron skillet and cook the onions + bacon pieces for about 4-5 minutes or until softened and bacon is slightly cooked. Put the partially cooked onions + bacon on a baking sheet (with all the juices from the pan) while you continue chopping the many brussel sprouts you bought! Put the potatoes, brussel sprouts, and apple pieces all into a mixing bowl. Toss with ghee (or oil of choice) and season with salt and pepper. Place these veggies on the baking sheet with the onions and bacon and mix together and spread evenly on the pan. Start to bake this mixture in oven while you sear the chicken thighs on the stove. In the same cast iron skillet used to cook the onions + bacon, add a bit more ghee and heat to medium, once hot place the chicken thighs skin side down and sear on each side for about 3-4 minutes (until browned on the skin side). After all the chicken thighs are seared, place them in the oven on top of all the veggies and continue cooking for about 25 minutes. Total cooking time will be about 30-35 minutes. Keep an eye on everything and chicken should be done when 170 internal temp is reached. Once or twice while the chicken is roasting, pull out the baking sheet and brush the chicken thighs with balsamic vinegar. 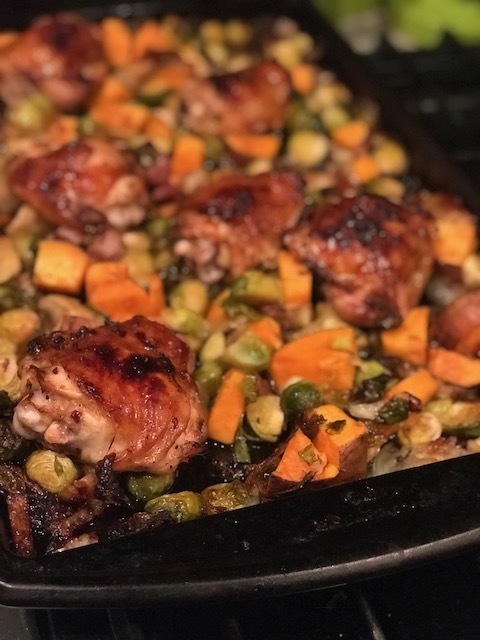 I like when the brussel sprouts get a little crispy or burned, so you might need to take the chicken off and continue cooking the veggies depending on your oven. ENJOY!